Travelling around South East Asia is a well-trodden route. So many people are spending a few months in Asia as part of their gap year these days. What I did find however is most people go to the same places, do exactly the same thing and travel in exactly the same order. When it came to choosing which way we went around South East Asia it all came down to what was high on our priorities and having to be in certain places for pre booked flights. However, if I had of had a few more weeks getting around Asia wouldn’t have needed such precise planning. In the end we chose to miss Northern Thailand and Laos in favour of travelling from Bangkok to Hanoi overland and exploring Vietnam properly. So here it is, everything I think you might need to know about travelling the ‘no-so-popular’ way around Asia in three weeks and four days plus Southern Thailand for 10 days. Make sure you use the Government Buses in Thailand to get around. There are three stations in Bangkok and plenty others all over the country. We originally booked a ticket to Ko Samet the day before however after missing that bus we turned up, purchased a ticket and were on a bus within the hour. REMEMBER no matter what a company says no busses cross the border at Hat Lek/Cham Yeam. For more information on border crossings check out this post. We booked none of this journey ahead of time. Cham Yeam border to Koh Kong = $6.70 (for 2 of us) – YOU WILL HAVE TO HAGGLE HERE – so many cars that want to charge you double that, but if you wait long enough you can find a moto tuk-tuk who will charge you half the price! Accommodation in Ko Chang = Seaflower Resort – a bungalow with sea view and air con for $18.40 a night. Koh Kong was only a stop to break up the journey and work out how we would get from Koh Kong to Sihanoukville. We luckily managed to jump on the last ferry to Koh Rong or we would have had to spend the night in Sihanoukville. Getting back to Sihanoukville was pretty simple, just make sure if you are heading out to Otres Beach you know if its 1 or 2!! The drive from Sihanoukville to Siem Reap was 10 ish hours and is offered as an overnight service but after every horror story I have heard of overnight buses in Cambodia we chose to waste a day on the bus! Cambodian’s still get up at their regular time of 5am and then drive all night thus fall asleep at the wheel. We found most buses will pick you up from your accommodation at the beginning of your journey. If you want to know how to spend a day at the Angkor Temples then check out this post. There is only one road from Phnom Penh so you travel along the same road as getting there. We were lucky enough to book accommodation within walking distance of the bus stop. Learn about my S-21 Prison and Killing Fields experience here. Another border crossing journey this time super easy as we already had our visas and the busses run over the border. Read more of the Bavet/Moc Bai border crossing here. REMEMEBER you have to buy a Vietnamese visa before you get to the border. Again our accommodation was within walking distance – this was a great way to save a few bucks here and there. For the whole journey north in Vietnam we purchased one bus ticket from Sinh Tourist. Need some ideas of what to do in Saigon then check out this blog. Our first Asia night bus wasn’t so bad however I found their driving uber scary!! There was so much about Nha Trang and Hue that surprised me. I ABSOLUTELY loved Hoi An, it was so picture perfect and I purchased a few tailor made dresses. I wasn’t a fan of Hanoi but it’s a must if you want to visit the amazing Halong Bay. We then spend 2 nights in Hanoi and 2 nights in Halong Bag to make up three weeks and four days. From Hanoi we flew to Bangkok and then Bangkok to Phuket – TIP if a flight is coming up expensive try flying to a bigger airport and then getting another flight to your final destination. Hanoi to Phuket was super expensive but stopping in Bangkok made it affordable. We choose to spend a few days in Phuket just chilling out after such a nonstop time in Vietnam. From there we chose which islands we wanted to visit and how to discover the Andaman Coast the best. Our next stop was the beach town in Krabi to be able to explore the beautiful Railay Beach. We chose to see another area of Phuket in Patong but I really didn’t like it and wished I hadn’t of wasted two nights there! We also made a huge mistake getting a minibus instead of the Government bus. It was cramped and we ended up being heard like cattle with the journey tking far longer than it should have. There you have it, all transport and accommodation costs for five weeks in South East Asia. You can find more in-depth posts on Thailand, Cambodia and Vietnam – describing things to do and ratings of each accommodation. For food I would recommend about $3-4 a meal and more if you would like drinks, although most drinks will only cost $1 each but you can see a better break down in my monthly summaries from my time in Asia here and here. If you have any more budget costs for South East Asia do not hesitate to send me an email and I will do my best to help you. You can download all this info as a PDF here. Next Post Planning A Roadtrip Around Scotland And I Need Your Help! Love this post and so helpful! I have just got back from 6 months in Asia myself and have the blues so badly! What a magical place it is to explore. 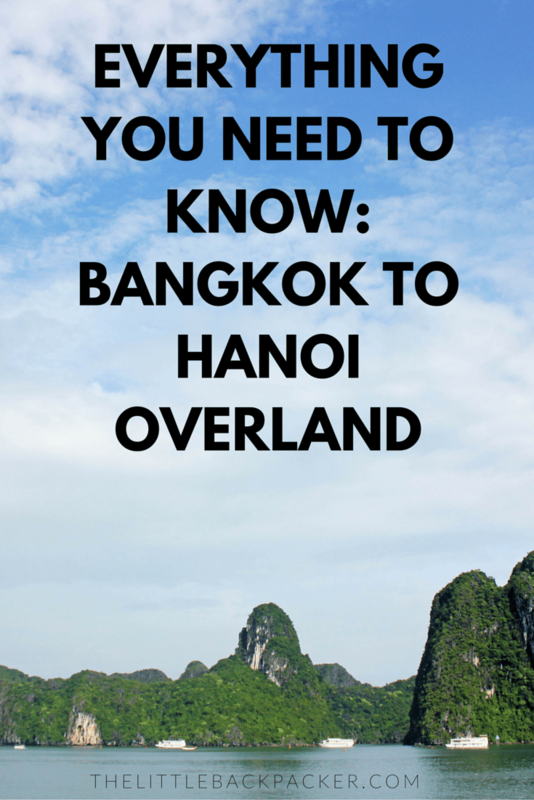 Is 3 weeks to short to travel from bangkok to Hanoi? You could do it but you wouldn’t have much time to see the sights. We spent just two weeks doing the coast of Vietnam.